“Save me from drowning in the sea, beat me up on the beach”, familiar? This popular song by Robbie Williams from 2001 reminds of Rudyard Kipling’s poem “Mandalay”. Even though he never actually visited the city, he wrote a first-person story about a British soldier in the 19th-century Burma, who has returned to Britain. The British rule over Myanmar (Burma at the time), lasted from 1824 to 1948, and as in many formerly British-ruled countries we’ve already visited, signs of the colonisation are still visible. 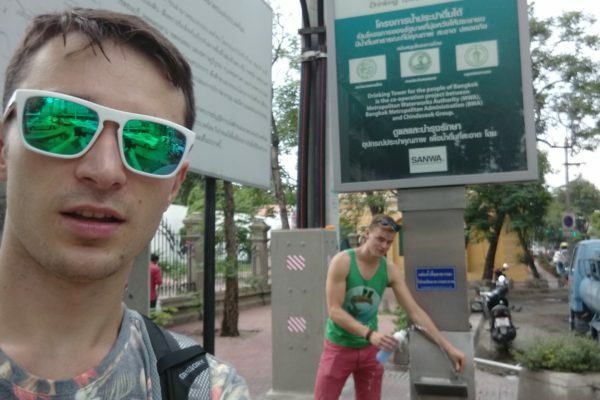 As it’s “prohibited” for tourists to ride motorbikes in Mandalay, we explored the city by bicycles. At Mandaly Hill, another pilgrimage site for Buddhists, an Indian man came up to us to read our hands. For 3000 Kyat (about €2,-), he would predict our future. We sat down in his little booth, and he grabbed my hand to read the palm lines. “Yes, yes, very good.. mmm yes yes. You see this line here? This means long and healthy life. Mmm yes, when you 27 you millionaire! And… you’ll have 1 wife, and two children! Ok. Thank you. Next one please.” Then Radek sat down to get his coming days predicted. “Mmm yes, also very good. Long line, means very good life. Mmm, next year no good for you, but year after, you millionaire. Ok. Thank you.” Radek: “that’s it?”. “Uhm… okok, yes, I see you get two wives! And four kids! Ok thank you, 3000 Kyat please.” So, there we had it, indisputable truth that Flo-Bro will be a hit and our families will grow large! On our bicycles, we visited the more the suburban areas of Mandalay. Where kids alongside the road stop everything they’re doing to wave, and yell: “Mingalaba!” (Hello!). As we were cycling we came across the University of Mandalay, and decided to have a little sneak peek. Its’s a beautiful old building, but it looks like it is slowly falling apart. The tables in the chemistry department were full with old equipment such as beakers and flasks, but not a single student to be found. As we walked around the campus we barely saw any students. We asked someone if there’s a holiday or test-week, but he said that they’re only 2.000 students enrolled, divided over 19 different departments. 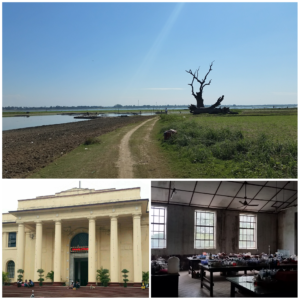 The book “Finding George Orwell in Burma” explains how the strict regime negatively influenced student enrolments, more here. After a day of exploring new areas, we thought it was a good idea to also try some new food: goat brain. It tasted like it sounds. A freezer on wheels, also called a VIP night bus in Asia, brought us to our next destination: Kalaw. 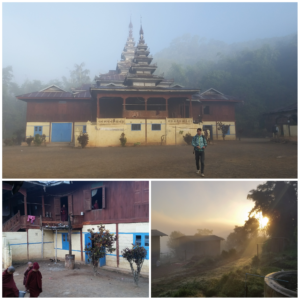 This town is considered as one of the best hubs for trekking through Myanmar, and we decided to go with the 2 nights / 3 days option. In these three days we would walk about 60km to reach Inle Lake. 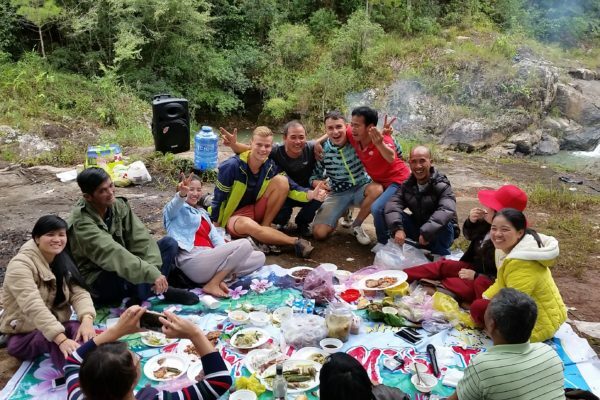 With four Germans, three Israeli’s and one tour guide we started our trekking from Kalaw. The route to Inle Lake was absolutely beautiful. 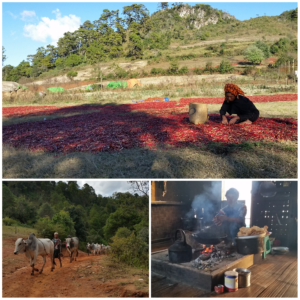 Fields covered in chili peppers as far as the eye could stretch, buffalo’s who crossed our path, cold rivers to take a bath, local hill tribes sorting and packing the chili peppers, and above all: astonishing views over the countryside. The first night we arrived in a small village without electricity where we could spent the night. It was already getting dark, and a lot colder, so we warmed up around a campfire and chatted the night away. The second night we got the opportunity to overnight in a monastery. A memorable experience, to fall asleep in a big room together with the monks who live and practice their devotion there. Then, after three long days of hiking we arrived at our goal: Inle Lake. This is the second largest lake in Myanmar, filled with floating villages and gardens, and of course… tons of boats packed with tourists like ourselves, trying to catch a glimpse of the traditional “leg paddling” fishermen. Nyaungshwe, a city on Inle Lake was our last destination in Myanmar. From here we took a tremendously long bus ride to the border with Thailand, Mae Sot, and from there another bus to Chiang Mai, Thailand (33 hours in total)! We spent our last week in Asia in Thailand, where it all began half a year ago. 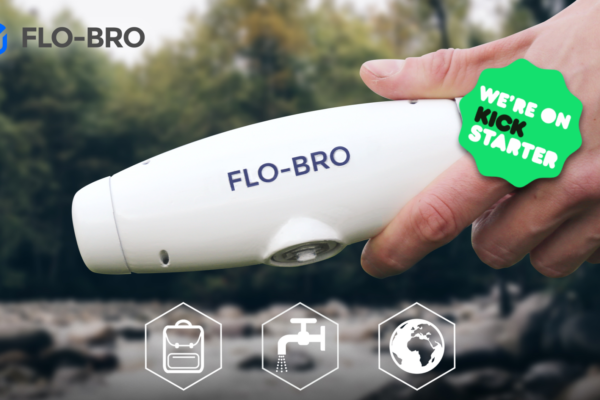 Now, six months later, the journey of a lifetime has come to an end, and we can start working full-time on Flo-Bro! Read “Finding George Orwell in Burma”. A must-read which gives great insights into the history of Burma, or Myanmar. For example, it explains why the country has changed its name from Burma to Myanmar, one of the steps of the strict regime to wipe out history. It also goes into more depth on the shockingly low number of university students. The (old) regime regularly shut down the universities, without announcing when it would open again. The result is that there are many students who need countless years to finish their studies, or simply can’t finish at all. During my previous travels I often heard why I HAD to go to Myanmar as soon as possible, before it get’s “ruined” by tourism. I never fully understood this and thought it was just one of those exaggerated traveller stories. However, now that I’ve visited the country I understand what everyone was talking about. The atmosphere and the attitude of people towards tourists is clearly different than other countries in Asia. I imagine this country still gives a good representation of the rest of Asia about twenty years ago, before the mass-tourism kicked in. We’re not usually fans of big cities, but Yangon (former capital of Myanmar) was different. Upon arrival, we immediately felt the relaxed vibe of the buzzing culture and the friendly people. Just walking around the city was the perfect way to experience the everyday life in Myanmar.